A barber gives a customer a shave in a small barber shop under the Phra Khanong Bridge. One of the things I love about Bangkok is that no two neighborhoods are alike. In 2015, while I was working on the evictions from the Bang Chak Market, I explored Ko Klang, a small island in the middle of the Khlong (canal) that runs between the Phra Khanong and On Nut neighborhoods. After wandering around the island, I walked through what I thought was a small market under the Phra Khanong Bridge (which takes Sukhumvit Road traffic over the canal). There were a lot of small barbershops under the bridge, but it was too early in the day and most of them were still closed. 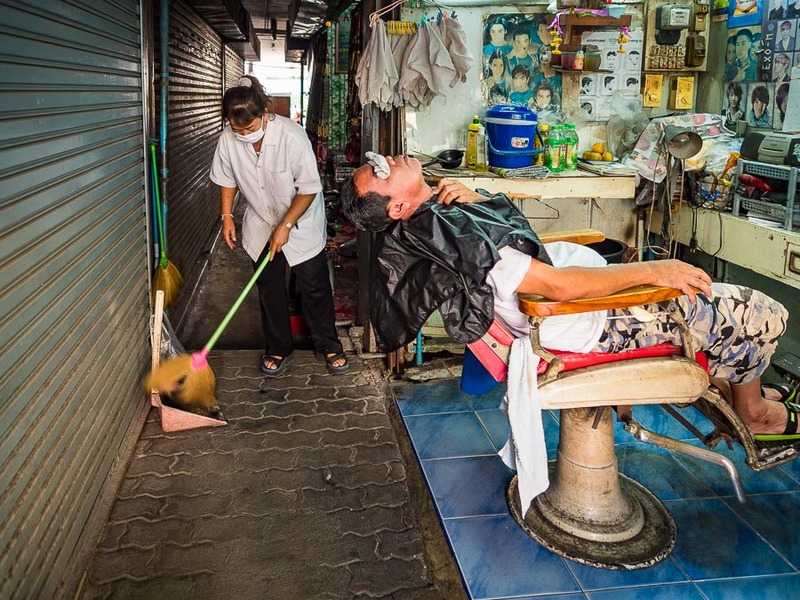 A barber naps while he waits for a customer. Bangkok's wet markets open early in the morning but most businesses don't really get going until mid morning. Or later. That's the case with the barbers under the bridge. In the year since the first visit, I made repeated trips back to the bridge and the barbers were never open. The ones that were open were not busy. There 9 or 10 barbershops under the bridge and a couple of beauty shops. Most have just one chair. I made another run at the barbershops yesterday, many were open and some had customers. I hung out under the bridge and photographed for a couple of hours. 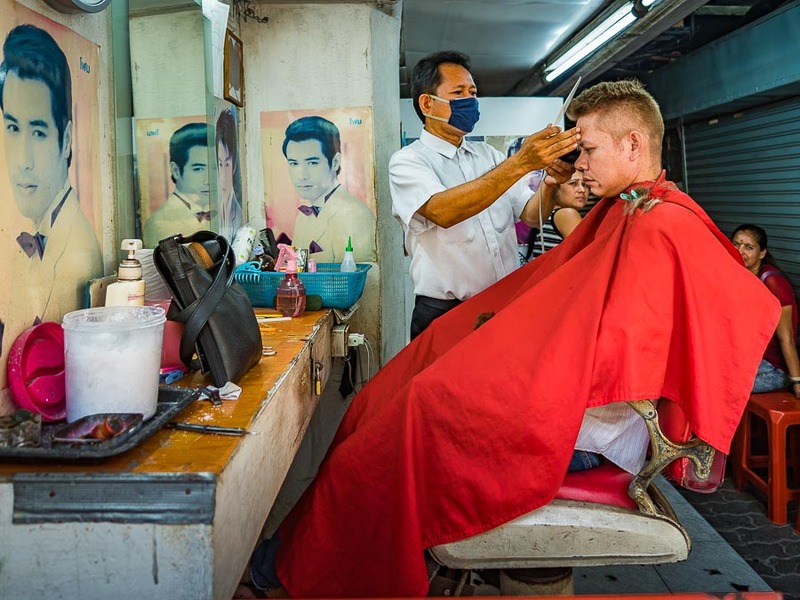 There are street barbers all over Southeast Asia. 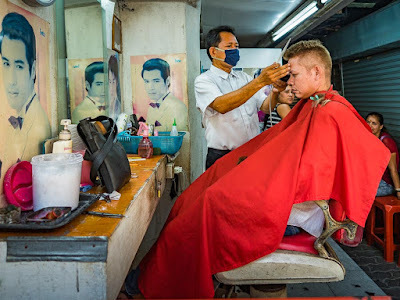 But because the Thailand is so much wealthier than its neighbors, traditions like the street barbers are disappearing, especially in Bangkok. 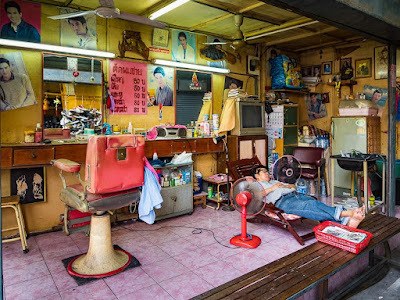 The barbers under the bridge are about the closest thing Bangkok still has to the street barber tradition. A barber cleans up after finishing with a customer, while another customer waits for her to start with him. Bangkok is changing at what feels like light speed. Neighborhoods are being relocated, markets closed and vendors evicted, all in the name of development. Thriving markets just a kilometer or two either side of the bridge have been closed so developers can build new condominiums. 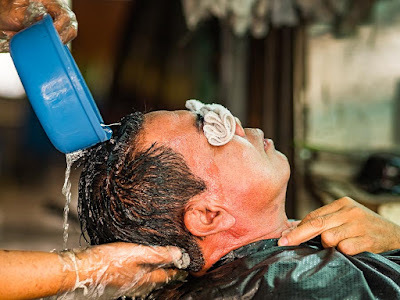 A customer gets a shampoo and shave in a barbershop. The shops are small and dingy. In some cases, the walls are made of plywood. In other cases the barbers use the bridge abutments as walls for their shops. I'm hopeful though that the community of barbershops under the bridge will survive a while longer. What will save the barbershops, and other merchants under the bridge, is that there's not much else the land can be used for. The bridge is a major conduit for traffic coming in and out of Bangkok, it can't just be torn down. The danger for the barbershops is that the market and community north of the bridge would be closed and torn down. The barbers would lose their customer base. 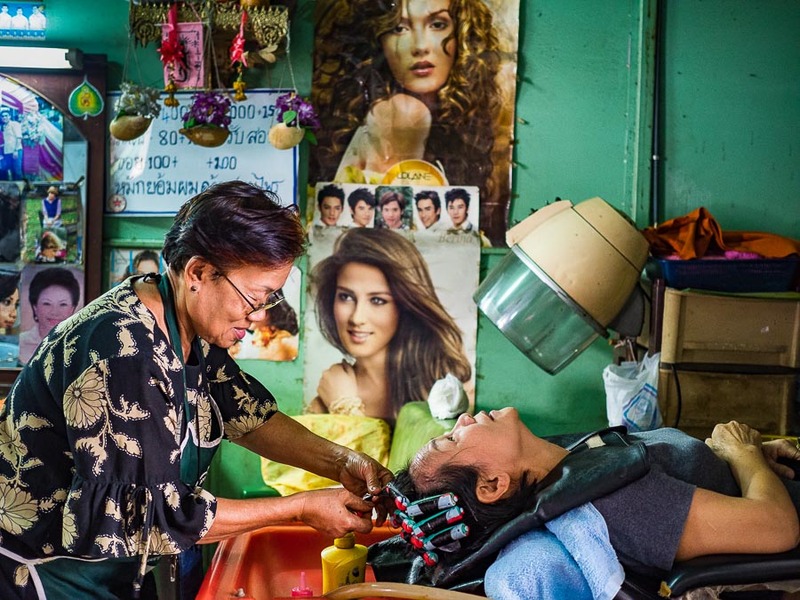 The barbershops are decorated with pictures of Thai and foreign movie stars and celebrities. I'm optimistic that this won't happen in the near future because there hasn't been any talk of it yet. But in two or three years? Anything is possible. 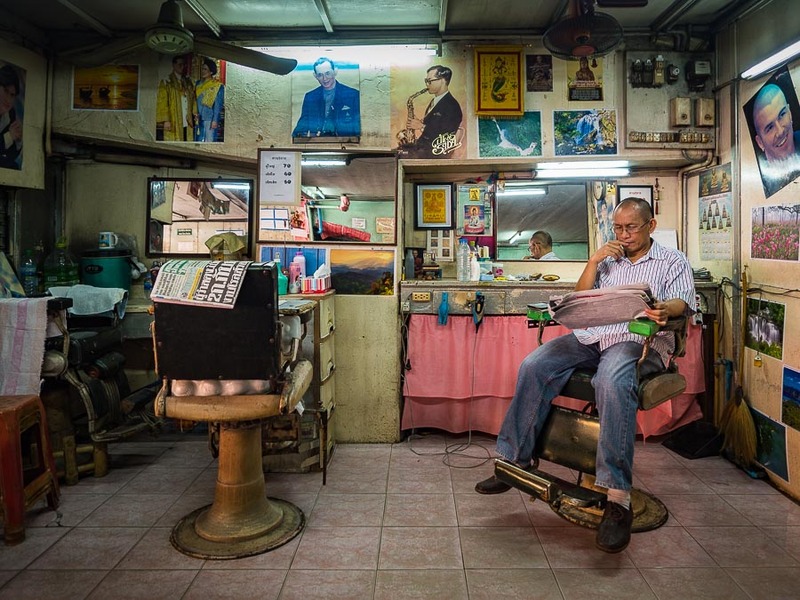 In what is a nearly universal scene, a barber reads a local newspaper while he waits for customers. The give away that this is Thailand are the portraits of Bhumibol Adulyadej, the revered late King of Thailand, that decorate the walls of his shop. 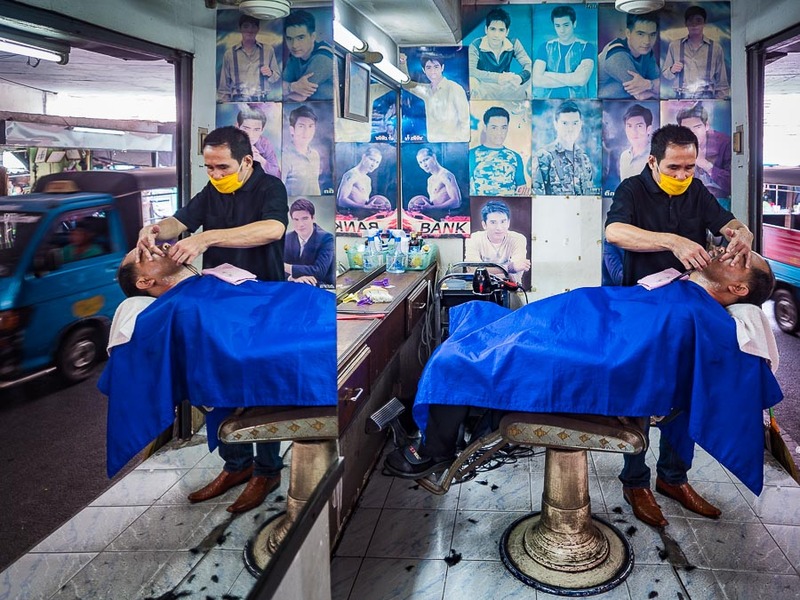 There are more photos of the barbershops in my archive.